Cymbidium orchids are highly desirable plants for their showy, colorful flowers. These tropical flowers, which are native to the tropical forests of Asia and Australia, come in a wide variety of colors and sizes. Cymbidium orchids are often grown in containers as indoor plants, especially in climates that are too cold to support outdoor growth. Cymbidiums come in several different sizes. Standard cymbidiums have the largest flowers (up to 5 inches across), according to Colorado State University. These flowers are prized for their uniform roundness. Miniature cymbidiums are smaller versions of the standard type. They grow up to 3 feet tall, but the flowers are smaller. Miniature cymbidiums are also easier to bloom than their standard counterparts. Cascading cymbidiums produce even smaller blooms, but the blooms flower on long, gracefully drooping spikes that can be as long as 30 inches. These orchids are a terrific choice for hanging baskets. Cymbidium orchids bloom in shades of almost every color imaginable, except blue. There are also no true red cymbidium orchids. The flower petals are thick and waxy, and are arranged with three on top, two on the bottom and a lip in the center. The lip houses the reproductive parts of the plant and is usually a contrasting color from the petals (sepals). The leaves are long, narrow and arching. Cymbidiums do best in a planting medium that drains well. It should be composed in large part of bark, perlite and peat moss, according to Colorado State University. Keep the potting medium consistently moist. Fertilize in the spring and summer every other week with a fertilizer high in nitrogen (30-10-10). In the fall and winter, fertilize once a month with a high-phosphorus fertilizer (10- 30-20). Apply according to the directions on the label. Cymbidium orchids grow and bloom best if exposed to bright light, according to Colorado State University. This does not mean hot temperatures, however. The best combination is a lot of light with cool (around low 70's Fahrenheit) temperatures. In addition, these plants need a humidity level of around 50 percent. Place your potted orchid on a shallow tray filled with pebbles that are barely covered with water to increase the humidity around your plant. Common indoor insect pests, such as spider mites or mealybugs, can attack orchids. Rinse them off with a strong stream of water. Cymbidiums can also suffer from root rot, a fungal disease, if the planting medium does not drain well. 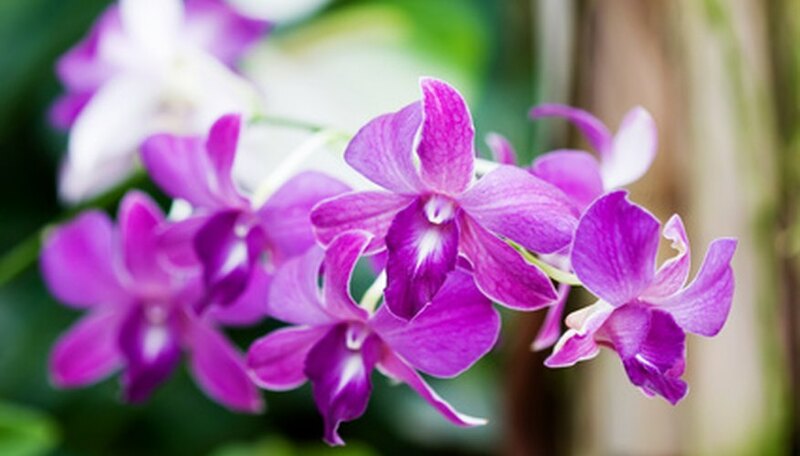 Make sure you do not plant your orchid in heavy soil, and also make sure that your container has a drainage hole.